Vehicle Wrap Options and Opportunities. The vehicle wrap process involves covering the surface of a vehicle in adhesive vinyl. The vinyl is digitally printed with a custom design and then positioned on the car, stretched taut, and shrunk to fit with a heat gun and squeegee. There are many affordable options and you may not need to leave your vehicle at the shop for more than a day or two. A short curing period of a couple of days will make sure the vinyl is properly adhered before washing. A full wrap allows the most graphic design flexibility. Proper attention to full contact and well turned edges are essential to keep the wrap from peeling. Add magnetic panels over full wraps to focus on temporary promotions or events. A partial wrap covers part of the vehicle. 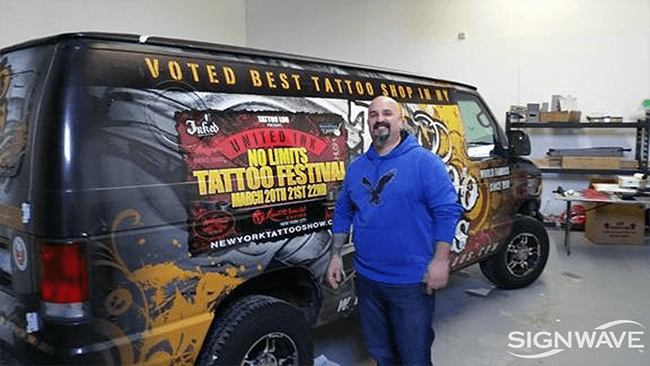 This may require a smaller investment, which could be significant depending on the size of your fleet, and a partial vehicle wrap can be extremely effective at promoting your services and your brand. A simple, single-color graphic classes up this boat engine cowling cover. Spot graphics may consist of cut vinyl logo art, and lettering that may include contact information and a call to action. The vehicle itself is the backdrop for the graphics, so it’s important that your fleet is clean and consistent. A knowledgeable sign company will advise you as to which approach will best accomplish your goals within your budget. How do you design the graphics for my fleet or vehicle? 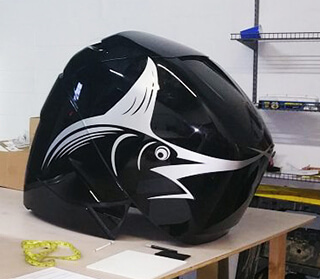 Brilliant graphics and exotic finishes can be achieved with adhesive vinyl. Your design should not only be beautiful but also functional, with good contrast for clarity and readability. Be aware of which surfaces are seen for a short time, in passing, as opposed to those which may be visible for a long time. Think about traffic patterns and where your wrapped vehicles will be parked. We’ll design your messages and place your call to action accordingly. We’ll also make sure your brand identity is handled according to corporate guidelines, uncluttered and with the correct colors and fonts. Careful planning and design is essential. While templates are available for reference, the sign designer should study each actual vehicle and take photographs for reference. You’ll be asked to approve a concept sketch before graphics are produced and applied. This sketch should be comprehensive in detail, color and fit. Flexibility for slight adjustments, as the vinyl film is stretched to fit the vehicle, should also be taken into consideration. We’ll consider all the details to make sure your fleet looks great and delivers the visibility your brand deserves. What is the best wrap vinyl for cars, vans, trucks or trailers? 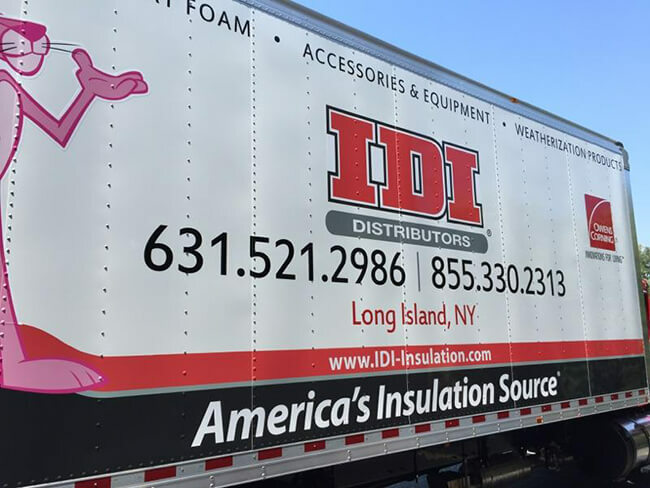 Your sign company will help you choose the right material for your vehicle wrap. Quality Vinyl from reputable companies like 3M and Avery will perform well as it’s heated and stretched during installation. It will last a long time (4-10 years), with easy maintenance, and trouble-free removal to accommodate future changes. Calendared vinyl works for box trucks or trailers with large flat surfaces, or partial wraps. Cast vinyl performs well for complex curves and intricate forms. Laminates applied over the graphics protect printed surfaces from abrasion and wear, and provide UV protection against fading. Meticulous prep work will ensure a smooth, flawless surface. Calendared vinyl works for box trucks or trailers with large flat surfaces. How do I protect my vinyl wrap investment? What if I want to make changes or need to repair my wrapped vehicle? Warranties are provided by the manufacturers of the vinyl, with various levels of protection according to your needs. As your designers and installers we will also stand behind every project. We’ll make design and installation convenient and cost effective for you, and we’ll be responsive to your needs going forward. When you’re ready to add matching vehicles to your fleet, or if any damage should occur, or if you need to update your graphics with changes, we’ll provide the same care and attention at every turn. Cut vinyl on a clean white body makes this vehicle look bright and fresh, with essential information right where you need it. What’s the first step in procuring a vehicle wrap? You can drive a vehicle right into our sign studio in Islandia, New York. Or we can come to you to discuss goals and requirements for your fleet. Call us at 631-767-9292 to set a date and time for a consultation.